Last weekend, things didn’t look so great for Smash Bros.’ top player, Gonzalo “Zer0” Barrios. For a moment, it seemed like reigning champ might actually lose a tournament. What you have to understand is, up to this point, Zer0 has not lost a any tournament he’s entered. That makes over 50 first place wins since November 2014. He was on such a hot streak, that earlier this year, players put a bounty on his head in the hopes of incentivizing someone to beat Zero. It never happened. Throughout that entire run, the pressure has only been getting worse for Zero. Being the most visible player for the game has its toll, after all. Some people cheered Zero on, happy to see him win everything he entered. Others wanted nothing more for him to lose. By the time Paragon rolled around, Zero was reporting feeling burn out thanks to the endless number of hours he spent practicing. He dropped from the tournament, but promised he would be back for the next one—Big House 5. That was last weekend. 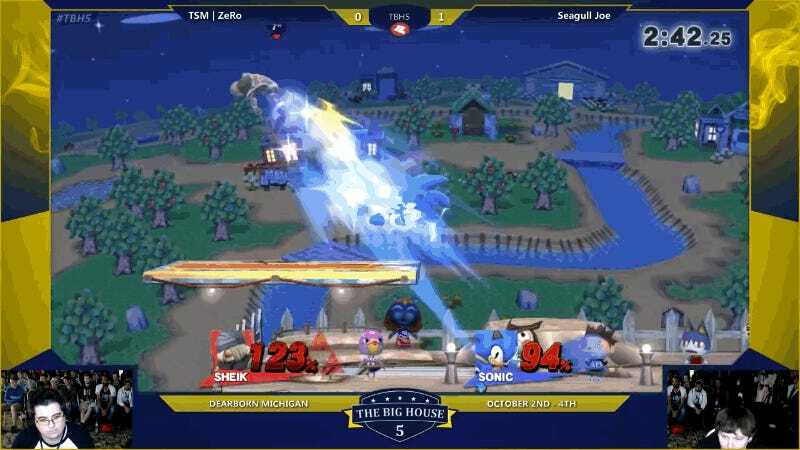 While Seagull Joe is known for being a good Wolf player back in Brawl, this wasn’t really the sort of match-up people were expecting to shake things up. Zero is the best player in the world, after all. And yet! Seagull Joe did surprisingly well against Zero here, much to the delight of spectators. “Of all the things I expected to see, I did not expect to see Zero day two dropping a game to Seagull Joe here,” one of the commentators said after Seagull Joe got his first win against Zero. Midway through the second set, you can hear the crowd start to chant for Seagull Joe. “If Seagull Joe can take this, this crowd is gonna lose its mind,” a commentator said. I can’t imagine what this must have been like for Zero. I assume it must have been hard, especially given everything up to that point. But as a spectator, seeing him in this position was, as funny as it is to say, genuinely exciting. Could someone else rise to the occasion, and finally take a tournament? Who could it be? Zero eventually worked his way back up to the Grand Finals. Normally his presence there wouldn’t be particularly noteworthy—if you keep up with Zero, you come to expect it, really. He’s the best in the world and all. But this was different. Zero’s claim to the throne didn’t seem like a given. He had to fight his way there. 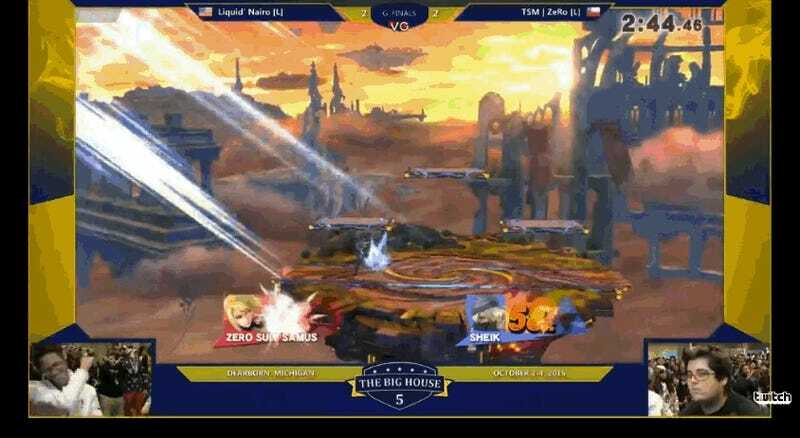 You can watch the showdown starting at 4:46:00 mark here, courtesy of VGBootCamp....Zero was playing as Sheik, and Nairo played Zero Suit Samus. It was close! Nairo got the first set, prompting the commentators to wonder if he could take the gold. Zero followed that up with a win of his own—and the crowd responded with chants for Nairo. Nairo, as if powered by the crowd, ended up landing a savage spike against Zero in the third set, ultimately winning that one on the whole. The crowd started heating up, and hilariously, the stream went down at that very moment—leaving many viewers on Twitch freaked out. Was the world going to miss this potentially historic match? Thankfully, the stream did come back online, and you can watch the second segment of the Grand Finals here. Overall, it was a tense match-up. 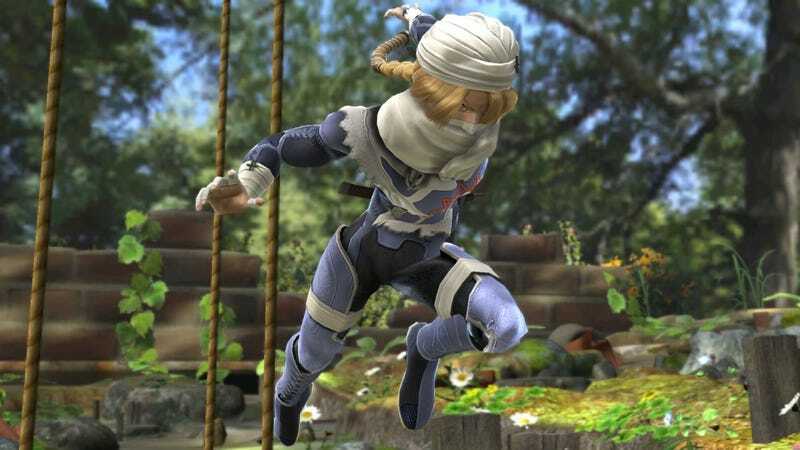 It helps that the crowd was lively—nearly every stock got a reaction—and that both Shiek and Zero Suit Samus are fast, fierce fighters. The entire thing was a joy to watch. I cheered when Zero landed the final blow; it was hype as hell—even though, yes, it was Zero winning everything yet again. It was different this time, though. Zero’s win wasn’t a given—and that made things all the more interesting.